View of the front of Glamis Castle in Scotland. 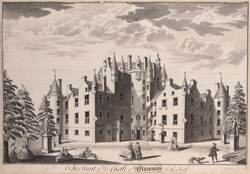 Originally Glamis Castle was a four storey tower house with battlements however in the 17th century it was restructured; the tower was heightened and roofed and two wings were added. Bartizans (battlemented parapets), over hanging turrets, cone shaped roofs and crenulations were also added to enhance the castles ornate appearance. The castle is the legendry setting of Shakespeare’s play Macbeth and Macbeth is actually the Thane of Glamis (a Thane is an old title of nobility in Scotland the nearest equivalent being the English Earl).